Hello Friends - Annie here with a cute fall card. 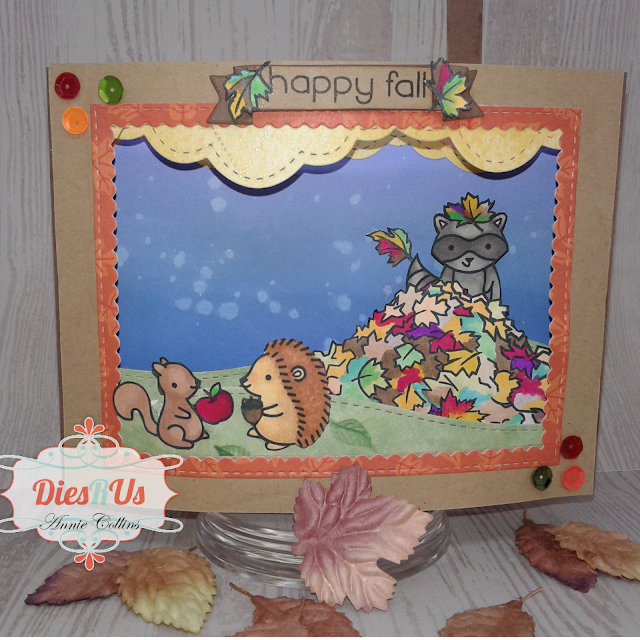 This card is a fun dimensional card - creating a full scene with a pull up raccoon from the pile of leaves. Now in the pile leaves is our friend Mr. Raccoon. How I created this dimensional fun card. I started with a card panel - A2 size, I applied Distress Oxide Ink in Blueprint Sketch and Shaded Lilac moving from the base of the panel. Next, I sprinkled with some water and set aside to dry. I also have ready to go 2 more A2 Panels in kraft and Brown cardstock. I then stamped the animals (Squirrel, Porcupine and Raccoon), Apple and Acorn and Leaves (from my stash - I have linked a stamp that you can use to create a leaf pile) using Memento Tuxedo black ink. i then colored the images using my Spectrum Noir Alcohol Markers. Next, I fussy cut them out - the coordinating dies are available I do not own them. Set them aside. Then, I die cut the clouds 3x, hillsides 2x and frame from pattern paper. Next, I decided where I wanted my leaf pile and raccoon to be on the panel. I then die cut the slider from the Distress inked panel. I also cut 2 pieces of cardstock measuring 2" wide by 4-1/4" long from brown cardstock - I scored them at every 1/2" these are for side panels. This creates 2 accordion panels. Now, that I have all my components it's time to put the card together. I start by cutting a simple rectangle into a card panel from kraft cardstock a bit larger than the scallop frame. I then adhered the frame to the kraft cardstock. Next, I layered two of the clouds and adhered them to the top of the Distress inked panel. I also adhered one leaf to the panel. I flip the panel over and add foam tape to panel creating a channel for the pull slider to move freely. I glue the piece of the slider (the part that is positive) to a thin piece of brown cardstock measuring 1/4" by 3" - this is what I glued my raccoon to - this creates a more finished look. Next, I placed it into place from the back of the Distress panel. Now, I adhered the accordion side panels to the distress panel. Then, I removed the foam adhesive liners and placed the Brown cardstock panel onto the back of the distress panel making sure the slider is in the channel and moving freely up and down. Next, I attached the raccoon onto the slider I just used a bit of foam tape. I then adhered a leaf on the raccoon's head. Set aside. Then, adhere the leaf pile to one of the hillside and then adhere the hillside to one side of the accordion panel. I repeat to the other side. Again, making sure that the raccoon can move freely up and down. Next, I adhere to the back of the frame one of the cloud and the hillside. I then flipped over the frame and adhered the squirrel and porcupine to the front of the hillside. Then, gave them a acorn and apple to give to one another as a happy fall gift. Next, I adhered the frame to the card side accordion panels I used clips to hold in place until the glue sets. I then, stamped the sentiment onto kraft cardstock adhered it to the banner die cut and added a few leaves to each side. Finishing touches- I added some sequins to 2 of the corners of the card. Now you have a finished dimensional Happy Fall Card. Thank you so very much for stopping by today be sure to share your creations with us!! 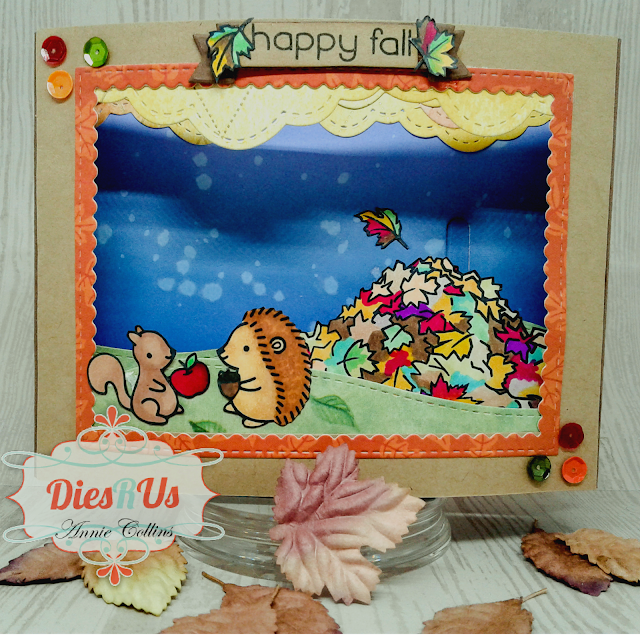 Thx for the great description on how your adorable fall card came along. Inspiring. Wow! I absolutely adore this card. Well done! OMG how cute is this creation! GREAT JOB and awesome inspiration! Thanks for all the details. Aww, how cute is that! Love it Annie! Such a fun card! I love that raccoon in the pile of leaves! Love those cute critters and the dimension this card has!